Cardinal marks are used to indicate safe and deep water in relation to a hazard. 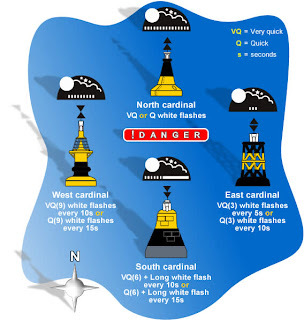 The lighthouse authority will only place as many cardinal marks as are needed to mark the hazard in relation to the shipping channel, this is often only one. 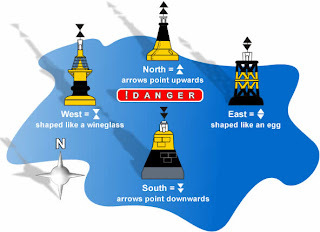 There are various ways of recognising the various buoys, the first method is the cones placed on the top - the North and South cone’s point in their respective directions. The west cones, some say looks like a wine glass hence west or a ‘W’ if it was lying on its side and the leftover one must be East! The other ways of recognising the different buoys are their colour banding (look closely and compare them) and their lighting pattern, which is like a clock.